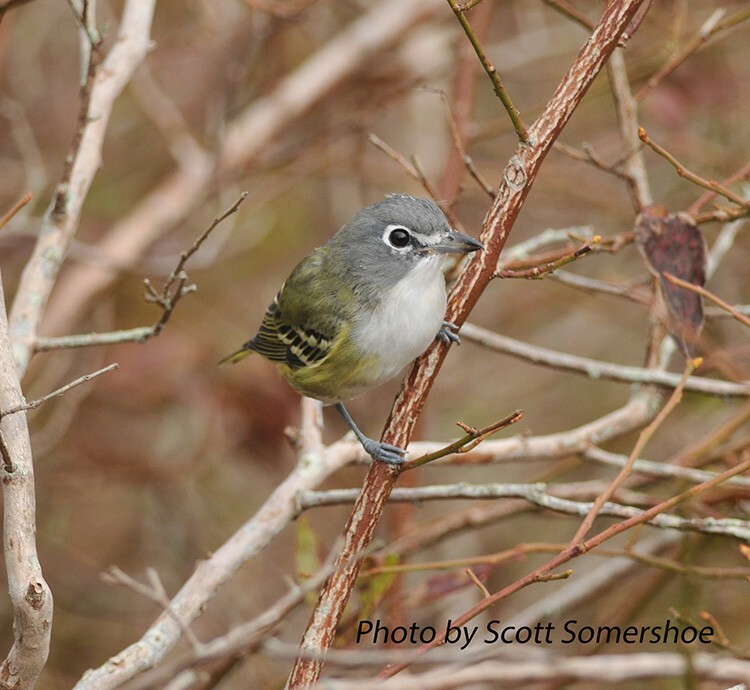 This vireo was known as the Solitary Vireo until genetic studies determined that it was in fact three species. The Solitary Vireo was then split into the Blue-headed Vireo in the eastern United States, and the Plumbeous and Cassin's Vireos in the west. The Blue-headed Vireo forages mainly in the mid-canopy moving slowly among branches searching for insects. In Tennessee it breeds only in the highlands of the eastern part of the state where it is one of the earliest migrants to return in the spring. The breeding range of the Blue-headed Vireo extends across central Canada to the northeastern United States and southward into the Appalachian Mountains. It winters from eastern Virginia, around the Gulf of Mexico into Central America. Description: The Blue-headed Vireo is a fairly small songbird with a bluish-gray head and bright white "spectacles." The back is olive-green, the dark wings have two whitish wingbars, and the belly is white with a yellow wash to the sides. The male and female look similar, but the female is slightly duller. No other vireo in Tennessee has prominent white spectacles, yellow flanks (sides), and a dark gray head. Habitat: Large tracts of mature coniferous and deciduous forests. Diet: Caterpillars and medium to large insects, also some fruit during migration and in the winter. Nesting and reproduction: Unmated males display to arriving females at partially built nests or at suitable nest sites. Pairs nesting at lower elevations may raise two broods in a season in Tennessee. Incubation: The male and female incubate the eggs for about 2 weeks. Fledging: Both parents feed the young, which fledge in 12 to 13 days. Nest: The thick-walled cup-nest is sometimes begun by the male, but usually completed by the female. It is constructed of bark strips, dry grasses, and plant fibers, and lined with fine grasses and hair, held together with spider web. The nest is decorated on the outside with spider egg cases or bits of lichen. The nest is usually suspended by the rim from a fork of a branch either in the lower canopy of a tree, or in an understory shrub or sapling. Nest heights in Tennessee range from 10 to 30 feet above the ground, with an average of 12.5 feet. It takes about 8 days to complete a nest. 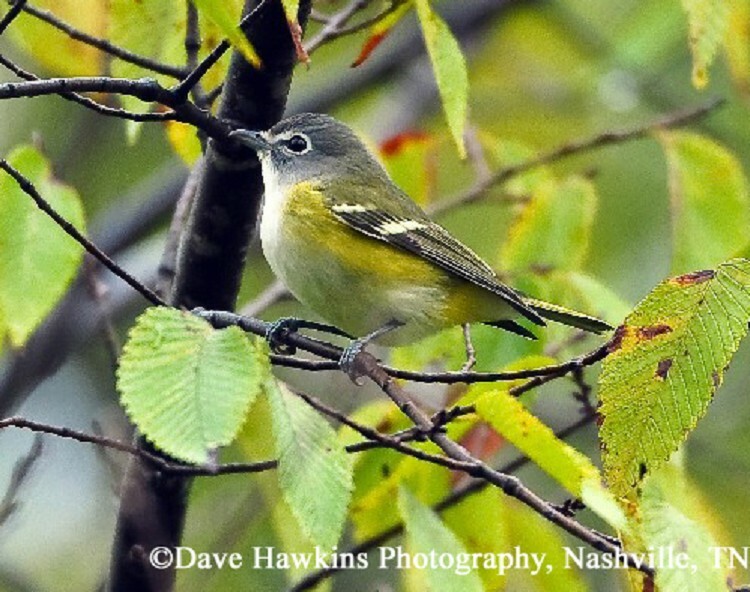 Status in Tennessee: Blue-headed Vireos are a fairly common summer resident in the mountains of East Tennessee. In spring, they arrive on the breeding grounds in mid- to late March, and are among the first of the returning migrants. Elsewhere in the state, they are an uncommon migrant arriving in late March and departing by mid-May in spring, and can be found from late September to early November in the fall. Numbers are stable or slightly increasing in the state. Since Blue-headed Vireos arrive in the spring before deciduous trees have leafed out, most early nests are built in conifers. In general, it is a myth that an adult bird will abandon its young if a human handles them. However, this does seem to be the case for the female Blue-headed Vireo. If the female witnesses her young being handled, she will abandon the nest leaving the male to try and raise the nestlings alone. If she is captured first and placed in a bag where she cannot see the nest, she will not abandon the young! The oldest known Blue-headed Vireo in the wild was 7 years 5 months old. Best places to see in Tennessee: During the breeding season, they are found at all elevations in Great Smoky Mountains National Park, higher elevations in the Northern Cumberland WMA and Frozen Head State Natural Area. James, R.D. 1998. Blue-headed Vireo (Vireo solitarius), The Birds of North America, No. 379 (A. Poole and F. Gill, eds.). The Academy of Natural Sciences, Philadelphia, PA, and The American Ornithologists' Union, Washington, D.C.